• What is the IoT in agriculture market size in terms of revenue from 2017-2023, and what is the expected growth rate during the forecast period 2018-2023? • What is the revenue generated from the different applications, such as precision crop farming, livestock monitoring and management, indoor farming and others? • What are the key trends and opportunities in the market pertaining to the Global IoT in the agriculture industry? • What are the key systems covered in the IoT in agriculture market? • How attractive is the market for different stakeholders present in the industry on the basis of the analysis of futuristic scenario of the Global IoT in agriculture industry? • What are the major driving forces that are expected to increase the demand for Global IoT in agriculture market during the forecast period? • What are the major challenges inhibiting the growth of the Global IoT in agriculture market? • What is the competitive strength of the key players in the Global IoT in agriculture market on the baiss of the analysis of their financial stability, product offerings, and regional presence? The report further includes a thorouh analysis of the impact of the Porter’s five major forces to understand the overall attractiveness of the industry. 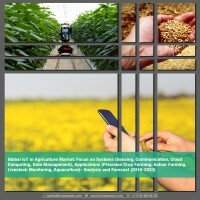 The report also focuses on the key developments and investments made in the Global IoT in agriculture market by the players, research organizations, and government bodies. Over the last decade, the global agricultural industry has witnessed a massive transformation owing to the increasing demand for sustainable farming practices. Rising global population and high-income growth have resulted in growing concerns of food security across the world. Various agricultural start-ups and technology innovators are developing numerous sustainable farming systems. One of the most disruptive technologies in the field of smart agriculture has been the internet of things (IoT) due to its increasing role in the field. Agriculture industry’s interest in IoT based farming has been evolving rapidly with applicability in various verticals, such as crop farm management, livestock monitoring, indoor farming, and aquaculture. The advantages of the IoT technology for agriculture are wide-ranging from farmers to equipment manufacturers to internet service providers. Adoption of IoT technology in the farming industry results in increased agricultural productivity and sustainability.